The Water Warriors Ultimate Explorer is the second largest water blaster released by Buzz Bee Toys Inc. in 2011 for their Ultimate Water Warriors System. The most notable feature of the entire Ultimate Water Warriors line is the ability for all the water blasters to connect to one another either on the top of the bottom. While connecting the blasters does not link triggers, pressure chambers, or reservoirs, linking does allow one to carry around multiple blasters more easily and offers interesting flexibility in blasting choices when using blasters in combination. The Water Warriors Ultimate Explorer looks similar in styling to the Water Warriors Vindicator, albeit slightly smaller. However, unlike the Vindicator, the Ultimate Explorer uses an internal air-pressure-based chamber as opposed to the Vindicator's rubber bladder. This is undoubtedly due to an injunction imposed on Buzz Bee Toys Inc. as a result of a lawsuit brought against it by Hasbro Inc. in 2010. Performance for the air pressure chamber, though, remains respectable though definitely not offering as much pressurized capacity that a rubber bladder chamber could have allowed. Nevertheless, streams have good power. The pressure chamber can actually be felt through the reservoir's opening. Its hard plastic shell occupies a notable amount of the reservoir's internal space. As the chamber is solid and uses air pressure, priming the pressure chamber with air is recommendable. As well, once can fill the reservoir, pump up the firing chamber, then top off the reservoir to gain one extra shot. The Ultimate Explorer features 5 differing-sized stream settings. These offer varying levels of output, though perhaps it would have been nice had a couple of these nozzles been pattern settings. 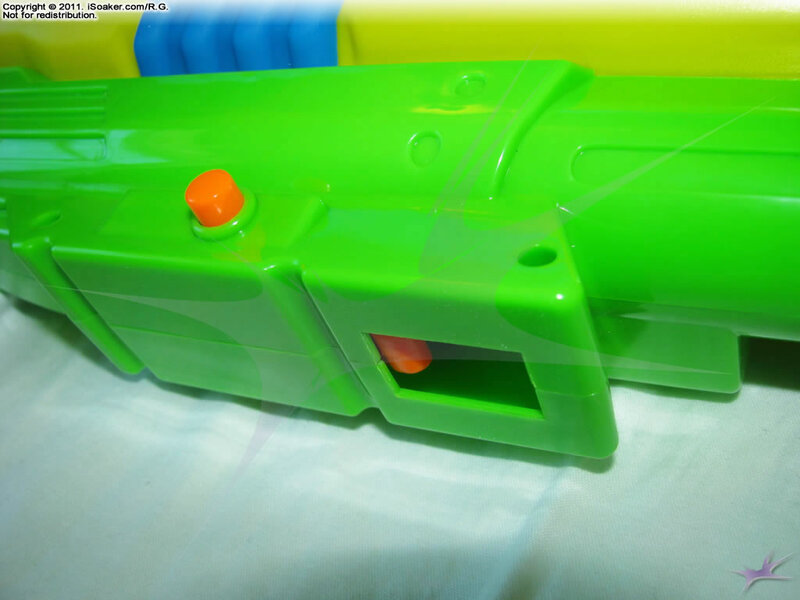 Interestingly, the Ultimate Water Warriors series appears to have ditched ball-valves and the trigger appears to be operating a pull-valve for opening and closing the nozzle. The Water Warriors Ultimate Explorer features a forward mounted pump that is not tracked. The reason for this becomes apparent when blasters are linked. The pump grip can be rotated when multiple blasters are attached with the extended forward tab making it easier to pump even when holding a stack of 2 to 3 linked blasters. Pumping, itself, is smooth as is expected and pump volumes are average for blasters of this size. The trigger and grip area on the Water Warriors Ultimate Explorer is positioned at the back of the blaster. This gives the blaster a nice, linear shape, and allow triggers of all blasters to be easily accessed when multiple blasters are attached together. The grip is a decent size, though having an attached base means that those with larger hands may be restricted in space. The reservoir of the Water Warriors Ultimate Explorer occupies the bulk of this blaster's body. Making the most of available space, the Ultimate Explorer holds a decent amount of water for its size. Granted, total possible reservoir space is limited by the size of the internal air pressure chamber which could have been smaller had an expanding rubber bladder been used. Of course, one cannot talk about the Water Warriors Ultimate Explorer without noting its connection points. As on all the Ultimate Water Warriors water blasters released in 2011, the Ultimate Explorer has connection points on its top and bottom. 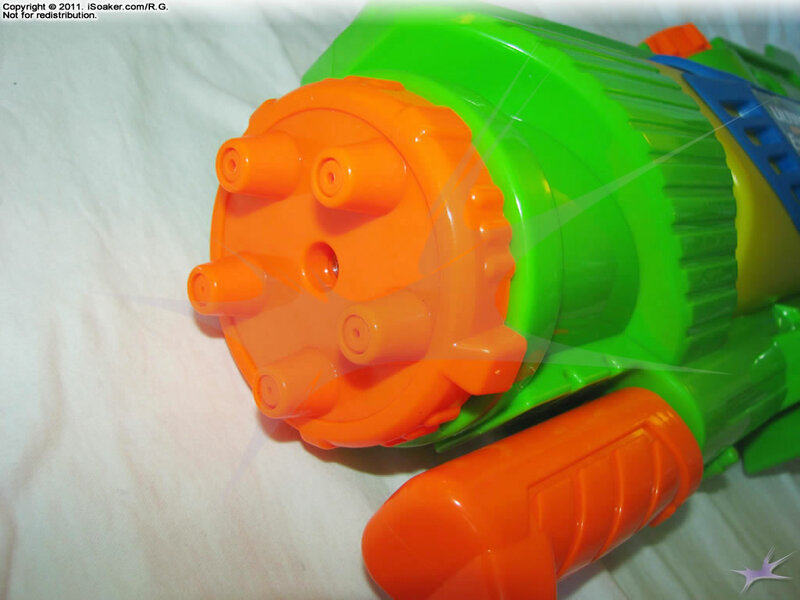 All Ultimate Water Warriors water blasters, unlike the Ultimate Air Blasters line, use identical connection mechanisms meaning that any blaster can connect to any other blaster on its top or bottom. 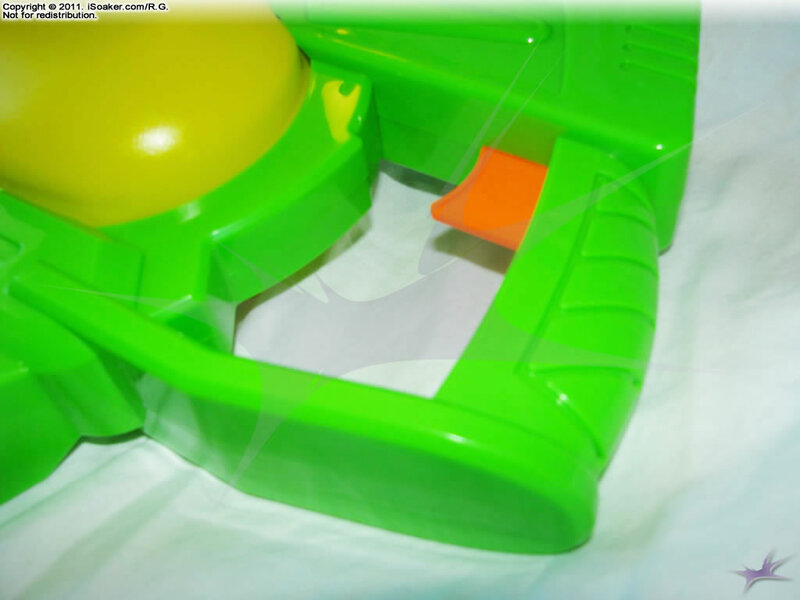 The top side of the blasters feature the "hook" and indentation while the bottom side of the blasters feature the attachment mechanisms and release button. Attaching blasters together is simply a matter of lining up the back point, angling the rear point into the lower blaster's upper indentation, and the clipping the lower blaster's hook into the upper blaster's attachment mechanism. Attaching and detaching blasters is fairly easy one you try it a couple of times. Those with smaller hands may have some difficulty though, particularly if dealing with fully loaded, heavier blasters. Though not necessary, having the option to link blasters is a nice-to-have feature. The main problem apart from weight gain is that some blasters must be unlinked in order to be refilled. As a whole, the Water Warriors Ultimate Explorer is a solid blaster with respectable power behind its nozzle. Its shot time is limited by its restricted pressure chamber size, but streams have a good kick nevertheless. 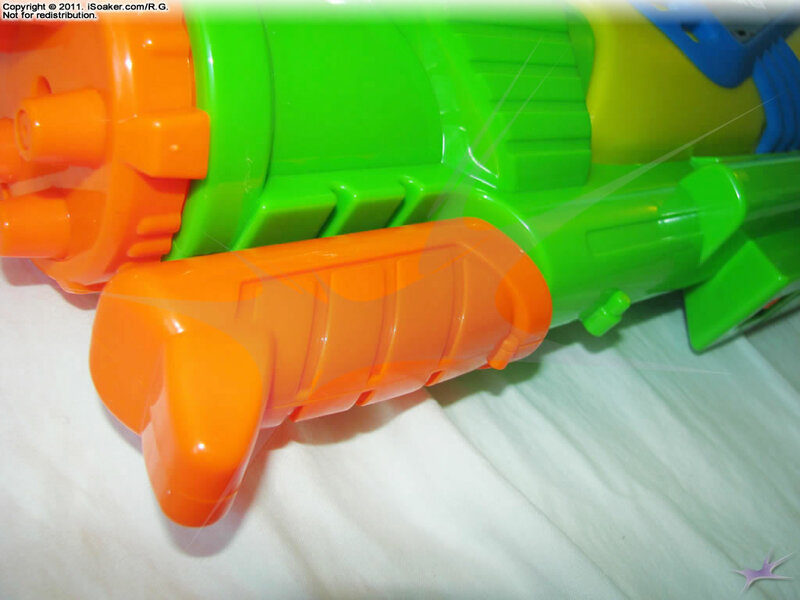 Five nozzle settings offers fine-tuning of output between its smallest and largest settings on the field while its ability to connect to itself and other blasters in the Ultimate Water Warriors line offers even more flexibility and possiblities to create a more potent soaking device. Though likely having reduced power to what it could have been, the Water Warriors Ultimate Explorer remains a good blaster, able to hold its ground against most other water blasters on the market. Just be wary of true CPS-class water blasters or older air-pressure water blasters with large, multiple pressure chambers. Solid streams with good power and performance. Five nozzle selections offers great flexibility on the field. Blaster looks and feels solid. Can be pumped and pressurized easily. 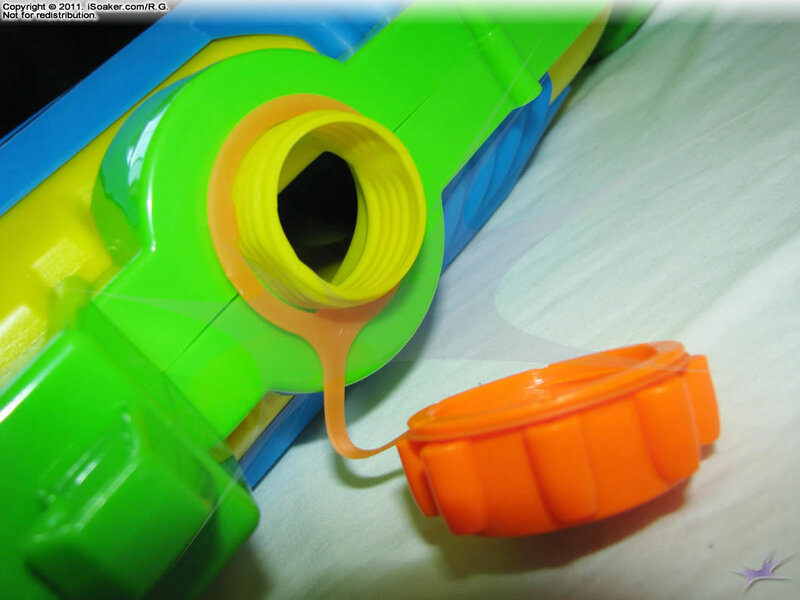 Attaches to any Ultimate Water Warrior water blaster to create more powerful soaking devices. Requires both hands to operate well. Opaque reservoir makes it hard to tell how much water remains. Pressure chamber capacity on the small side; shot times on the short side. No pressure chamber fill gauge since pressure chamber is internal. Some dead space in the pressure chamber that needs to be primed for optimal use and emptied for long-term storage.